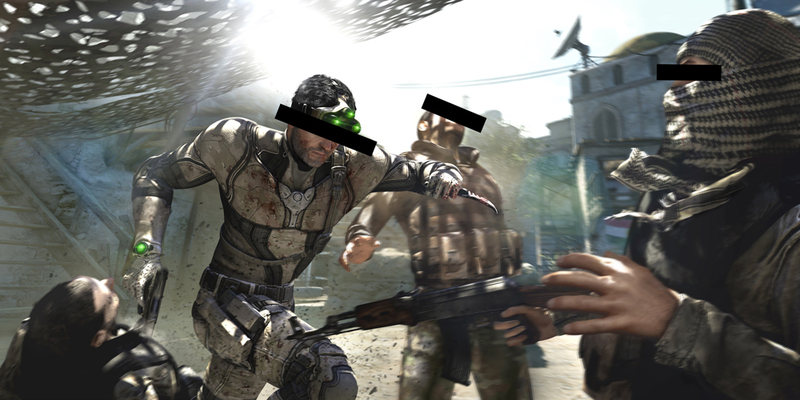 Splinter Cell: Blacklist has been unveiled. In our conversation with Patrick Redding, Game Director, we uncover exclusive details on the game’s overhauled AI and stealth gameplay. Sam Fisher is back. He may no longer growl with Michael Ironside’s gravelly gravitas, but he has returned to the grips of the US government. Spearheading black missions against the Blacklist terrorist coalition, Fisher’s new adventure harkens back to the glope-hopping Tom Clancy scenario that this super-spy was sorely missing. 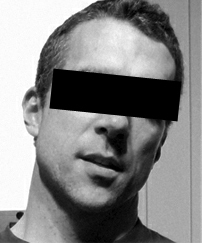 But what does it mean to be a spy, in this day and age? Unveiled with bombastic gameplay footage (above) at last week’s E3, and accompanied by a CG trailer (below) that’s more target render than glossy sell, Splinter Cell: Blacklist’s first impressions are ones of ‘spy’ and ‘stealth’ becoming separate ideals. Sneaky Bastards interrogated Blacklist’s Game Director, Patrick Redding, to find out if this is true. 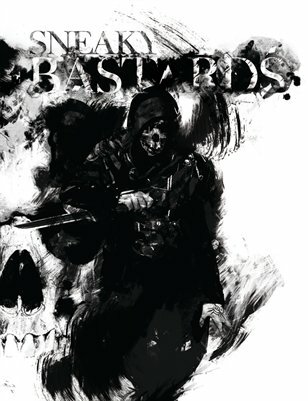 Sneaky Bastards: We understand stealth doesn’t demo well, especially in an environment where the game is packed shoulder-to-shoulder with louder, flashier shooters. So, reassure us. Tell us everything you can about Blacklist’s stealth systems. Get deep, get mechanical. Patrick Redding: I’ll be happy to do that. One of the things that was super important for us, and when we’re messaging these things, it’s very hard to go super deep and mechanical. With you, I can do it. With the majority of people, their eyes glaze over. So, for us, a big part of it is, we debated whether we were biting off too much by trying to say, well, let’s have stealth and action. But, ultimately, the philosophy was, no – this is a blockbuster game, so it’s not just going to be about having the breadth and variety and production value that we associate with action adventure. It’s that, multiplied by the depth of all of the systems that people expect from Splinter Cell. So we kind of joked that, in a sense, we’d bitten off the task of making the game four times larger than any of our competitors – but that’s what we’re trying to do. So, obviously it’s easier to showcase the breadth and the variety than it is to showcase all the systems and their depth. Because depth comes with time and mastery. But we’re supporting that. You want to hear about the stealth part, so we’ll talk about that. A big thing for me, personally, was, I love stealth, but I also know that, having gone back and re-played all the Splinter Cells recently, that the super fragile, brittle, insta-fail model where one tiny degree off and you’ve got to go back to the checkpoint – that’s punishing, that’s abusive, it’s not an accessible mode of stealth. Even for the people that love stealth games. Yeah, exactly! It’s poor failure design. And I think that when you look at the games that have come out since that have embraced stealth as a mode, they’ve done a really good job of tackling that. And that’s what we’re trying to do. So one of the things we’ve done is overhaul our AI substantially. We’ve introduced new archetypes and a whole new suite of behaviours so that even in situations that require the player to go undetected – and those moments exist in our game – we’re doing it in a way where, if the player starts to screw up, they can salvage the situation. They can save the day, and silence whoever they’re dealing with, and get back to the stealth. So it’s a more analogue nature of an AI alert system? That’s it. And it’s always challenging, because the more analogue you make the system, the harder it is to manage those threshold states. You’ve got to make them apparent to the player so that they’re not accidentally tripping over them. But all of the things – the light and shadow systems are still there. We all felt that the black and white filter was very jarring, and it meant that this very nice-looking game was masked for a good chunk of the time. So, instead, we’ve gone with something that’s much more familiar to players who’ve played Double Agent, which is the idea of the light meter on the back. We’re using our whole ‘in the lens’ visual design style, where we imagine that there’s a lens between the player and everything in the game – including the HUD elements. When we see light and weather effects and atmospheric effects, that’s going to alter the way the HUD looks, it alters the way Sam looks, it alters the amount of lens flare coming off of things. When he’s in the shadows, the lighting on his suit is very specific and distinctive, so you can tell that you’re in a stealth mode, but we’re actually relying more on the player’s own perceptions. The more analogue you make the system, the harder it is to manage those threshold states. Is that a binary shadow system? It’s based on the same stealth system we’ve always had in Splinter Cell, which is that there’s a certain number of bones on the player that can be illuminated, and we are literally simulating that. A lot of games will have a stealth system where the level designers are literally designating hidden zones, and if you’re in one, you’re hidden. That’s what Conviction felt like through the way it was presented – on or off, monochrome or colour. Which is tricky, right? And we had to choose a threshold where we had to do that, and you’d have a guarantee of being hidden. That was as much for usability as anything else, it was a concession we had to make so it would be playable. Now, what we’ve decided to do is back off that, because we’re teaching the player that shadow is one way to stay hidden. But there’s also just simply staying out of the line of sight. It’s occlusion, it’s being sneaky. So, in a way, we’re almost embracing a more comprehensive style of stealth play. Which makes the sonar goggles very important for performing occlusion-based stealth. Yeah, that’s right. And this is another way in which the game has a lot of depth to it. We haven’t talked much about it yet, because frankly we don’t have that much time to discuss it, but we have an entire economy system that is shared across all of the game modes, whether it’s singleplayer, co-op or Spies versus Mercs, and a customisation system for all of the weapons and all of the gadgets and even the suit itself that’s shared across all of those modes. And what that means is that the vision systems are things that are being upgraded. You’re starting out with one set of goggles, but you’re able to constantly refine and add new layers to it as you wish that are going to support a particular style of gameplay. So upgrading from night vision, to thermal vision, to sonar vision? Exactly. But they’re cumulative, in the sense that you can overlay these things. And we don’t want to give away all the goodies, but the people who are interested in playing in a stealthier fashion are going to be able to make the customisation choices that will best support that. People who are interested in playing in a stealthier fashion are going to be able to make the customisation choices that will best support that. How do the scripted sequences interfere with stealth? That’s a really good point. Without giving anything away, what I can speak to is the fact that when I have meetings with the scripted events teams, and the level design teams, there will be moments where I’ll say, okay, you guys have this down in here as more of a cutscene – it can’t be that, because we want to be able to keep AI active in the area for stealth players. And they’ll say, no problem, then take that out and replace it with a dialogue or something that’s a little bit faster. So that give and take is happening all the time. Occasionally, we might set up a pure stealth space by having a cutscene at the beginning and a cutscene at the end so we can book-end it. But those are things that we’re doing to help facilitate the player experience. In general, it is a more action-adventure style of storytelling, so we are going to see occasional intervention in terms of scripted events, but really, we try to minimise that, because we want the player to be constantly able to take different paths. Again, AI becomes a super useful aspect of that, because we’re now using our AI to communicate a lot more story elements to players systemically in the game environment. We’re now using our AI to communicate a lot more story elements to players systemically in the game environment. When we spoke before for the Trade Secrets series, you mentioned that much of that was going to be communicated in the reactions and expressions of the AI themselves. Is that the case for Blacklist? That’s exactly what we’re setting out to do. Obviously, it’s an ongoing process, and we’re watching the addition of new elements to the AI behaviour that’s going to help support that, and I’m feeling super encouraged by what we’ve been able to do so far. And now we’ll see, as we work on it for the next nine months, ten months, however long we’re going to get to polish it, we should be seeing a lot more of that. And obviously, content is expensive, systems are expensive to debug. When are we going to see more stealth-focused content in Blacklist’s PR cycle? The good news is, we’re already talking about what we’re going to be rolling out and letting journalists go hands-on in the coming months. Obviously a big thing for us is we’ve got to let people see what we’re doing on the multiplayer side. But even on the singleplayer side, we know that we’ve come out with a big, bright daylight bombshell. We need to also show other aspect of what the player experience will be like, and that will include the darker, shadowy, more classic kinds of environments. I think you’ll be seeing that in the coming months. We’ll be looking forward to it. Thanks, Patrick. Ubisoft Toronto has just released one of the stealthiest trailers for Splinter Cell Blacklist yet - check it out, here! Great interview! It’s great to see even the tiniest details on the stealth gameplay being wrung out of the developers. In the part where he’s talking about the goggle upgrades, I wonder if he means that night/thermal vision will be available in some way in the game. But for all I know the context might be slightly different or when he says “exactly” he’s referring not to the night vision stuff but instead just the general ability of upgrading certain parts of your goggles. I’d hate to get all excited over one potentially misworded answer. I really hope they come out with some good examples of stealth play in the coming months. But even if they don’t I’ll be reserving my full judgement until the game is out and I can see it without the obstructions that PR schemes can sometimes become- I’ve got my share of high hopes for this iteration of Splinter Cell, and I sure hope they can deliver on what they’re promising. Wow! Great details on the AI Gameplay. It’s really cool to see how the mechanics of stealth have evovled over the years since the very first Splinter Cell. I really like the new gameplay loop that Conviction gained which seem as if they will be even far better and more adjusted for the archetypes in Blacklist. Gone are the days of Lambert screaming at you for raising the 3rd alarm: “Fisher! What in God’s name do you think you’re doing? Get out of there you’re finished!”- Sam likes independence now! I am highly embarrassed by the new improvements including:open environment ,advanced cinematic like interrogation and marked multiple target finishing also battle field call support is very interesting. Further, it seems they embraced “Uncharted” game mode, that is: climbing, running , and hand to hand fighting. SC conviction based killing techniques which is a great feature . I am very glad to see my favorite whistle trapping system coming into existence again but still messing edge to edge switching and wall in between two walls standing. No Michael Ironside = Buying Used. You screwed up, Ubisoft. Buying used eh? Let me guess, you’re going to give your money to Gamestop aren’t you? You better not. Honestly, I don’t get all the fuss surrounding the replacement of Ironside. Sure, he was a great voice for Sam and I’m gonna miss having him as the voice actor, but at the end of the day I’m much more fussed about the gameplay itself, and the backlash from the fans seems like an overreaction. Overall I feel we should be placing much more pressure on Ubisoft to provide us a good, satisfying stealth game- which they didn’t entirely manage with Conviction- as opposed to pressuring them to not change a voice actor (especially when, most likely, what’s done has been done and is very unlikely to be changed back). Every article I read about Blacklist makes me more and more excited for this game. It really looks like ubisoft is trying to bring back a lot of the classic elements of the gameplay. Especially when I read that they are bringing back night vision and thermal vision along with the shadow system! Looking forward to hearing more! Game looks good, but recasting Sam… I don’t know about that. Did Michael Ironside simply not want to do another Splinter Cell or did Ubisoft decide that on their own? To me, recasting Sam after all these years is like 343i recasting the Master Chief – it’s just not the same Sam Fisher. A lot of people have dissed this game, before it’s been released. People should wait until it’s out…. Having just played through Conviction I really hope that Blacklist heads in the direction of Chaos Theory instead. I really miss the light meter and the fact that being spotted was disastrous. In Conviction I moved 3 meters from the place I was spotted and was fine which made the game way too easy. (I completed it on the hardest setting in about 6 hours). This interview has me interested in Blacklist but I really hope that we get a bunch of night missions a´la pre-Double Agent Splinter Cell. Great interview, btw.